The winter birds are all making their way to Florida and my backyard once again. I missed them terribly over the summer. I had some new birbs come visit. These golden brown birds had a finch looking beak. Could these possibly be female goldfinches?? If you might have an idea of what type of bird this is will you please let me know? 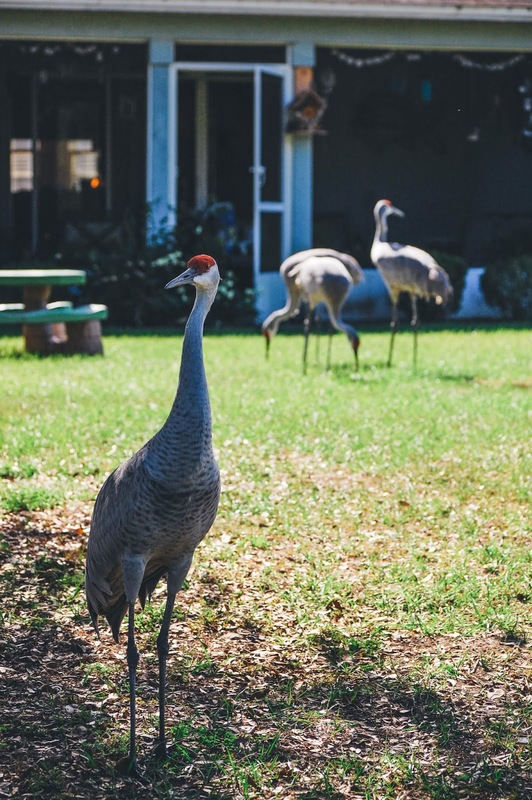 The Sandhill Crane family still swings by our house for some seed and water from time to time. They might comes three or four times in one day or simply spend the whole day here in our backyard. The girls and I collect the feathers they leave behind. We should probably name them. We had a hawk spend some time drinking in our birdbath. Based on my book it might either be a Sharp-Shinned Hawk or a Cooper's Hawk (though I am thinking Cooper's Hawk because of its larger size). He was a handsome fella. My eyes keep wandering to the feeders and trees outside our home. I cannot wait to see what else flies into our neighborhood. 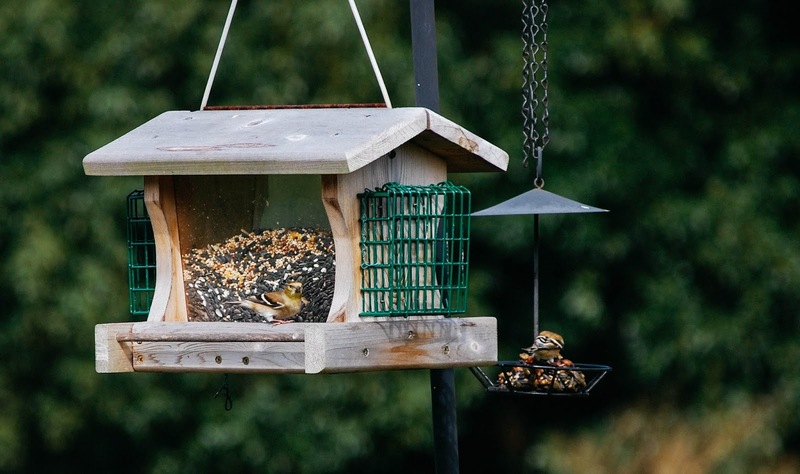 Those are goldfinches in the first picture. Their plumage changes in the winter so they're all olive green, males and females alike. 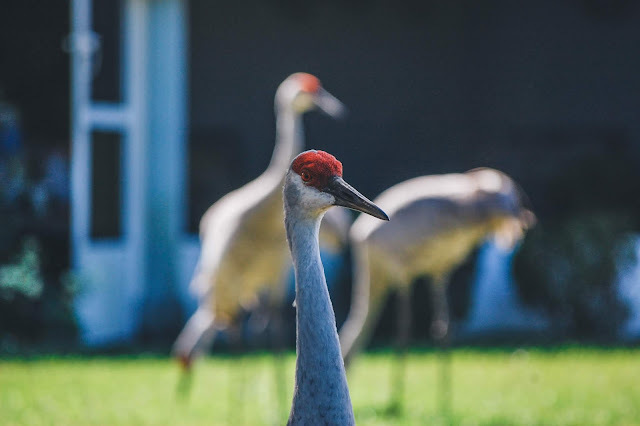 Love the sandhill cranes! We've had a few in the neighborhood as they've been migrating and they're great to see. Such an impressive bird! 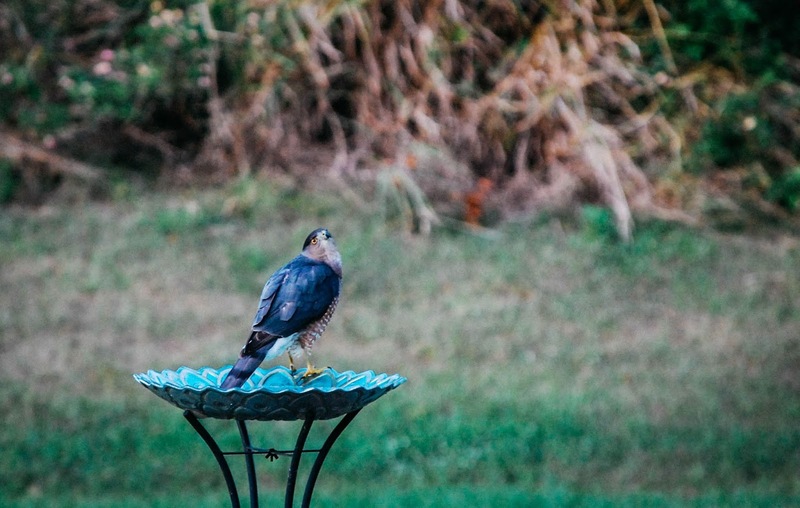 We just spotted a Cooper's Hawk at our house, too. It was hunting, but I believe the cardinal escaped. The junco's have arrived for winter, the cedar waxwings have migrated through, and we enjoy cardinals, goldfinches, house finches, flickers, red-tailed hawks, white breasted nuthatches and downy woodpeckers all year round. We've even spotted a red-breasted woodpecker! Are they?! WHOOHOO! I have been telling my friend Deb that I would LOVE to see some Goldfinches in real life. How exciting!! They are so cute!!! And yes, they are a golden olive bronzy shade. Beautiful. I don't think I have recognized a junco. I love that you get to see so many cool birds. We get the house finches and hawks and flycatchers. Our woodpeckers are red bellied and once in a while pileated. There are others but I don't see them often. I don't think I have ever seen a red breasted one! Enjoy your birbs!!! I am watching Bob Ross paint right now and he was just holding a Cedar Wax Wing chick and I was cooing over "the lil devil." Yep, what she said! lol We still have finches coming to our feeders and yeah, the yellow is pretty much gone now. I wish we got more cardinals here. I'll see one every once in a while but nothing nothing like what my mom gets. I get Blue Jays though, and she doesn't. Nice! As soon as Sarah said they were finches I did a little yelp! As you know, goldfinches were on my hot list of birds I wanted to meet. <3 I am still on a high! Cardinals are so festive and Christmas-y. Now I am wishing I could see them perched on a snow covered branch, but that is asking a bit much for my backyard. I can't be too greedy. I love Blue Jays! We only get one or two once in a while but they are gorgeous. Beautiful! I love birds! I believe that is a Cooper's Hawk. 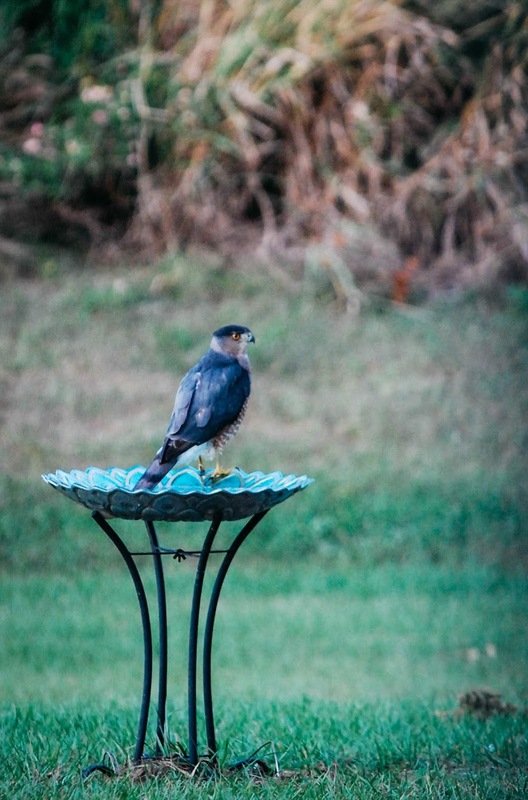 We have a sharp shinned hawk who visits our yard every fall. They live year-round in my neighborhood, but I only see this one in the yard every Oct. I miss all of the beautiful water birds in FL. We get a lot of birds here - the main ones in my yard are cardinals, blue jays, grackles, crows, scissortails (not year round), sparrows and finches, hummingbirds, always hawks and vultures and kestrals overhead, woodpeckers - sometimes I see roadrunners at the ranch where my dog goes, too, but never at my house. One bird I've never seen in person and would love to see is an indigo bunting! Oh cool! Thank you, Nancy! I am glad you told me that as I am trying to make use of my birding guide but sometimes it is hard to tell. You have such a staggering amount of beautiful birds! I tried all year to lure some hummingbirds to my yard this year but none every arrived. I know they are here but ah well. And kestrels!! I think they are adorable. I would love to see a roadrunner. I am glad you have all this wildlife around you. I hope your new home will too.